Getting Better or Being The Best? First, the good news. 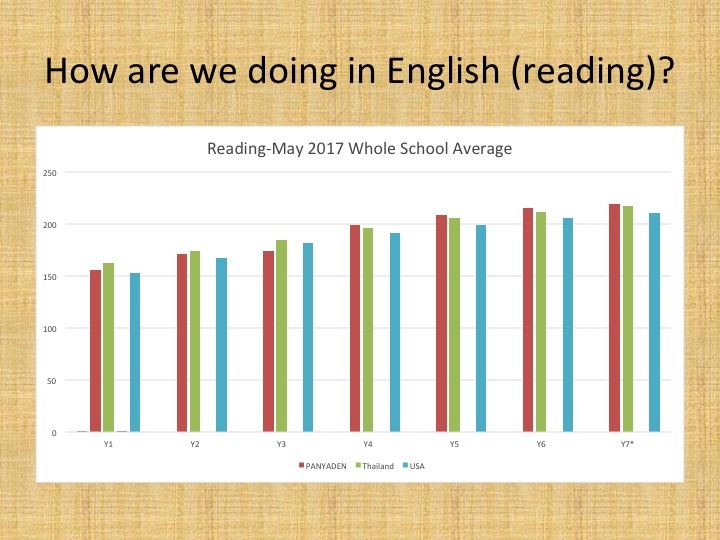 Panyaden students are, as a whole, doing very well academically and we have the data to prove it (see charts below)! 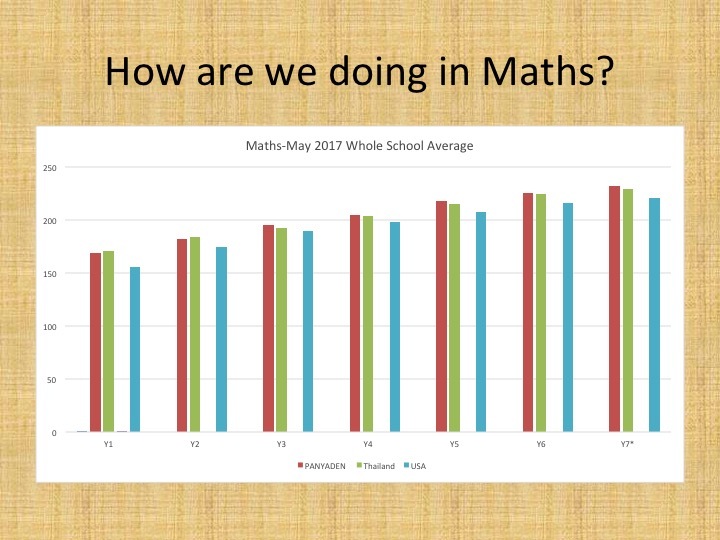 Our 2016 results in Maths and English show that Panyaden is equalling or outperforming other international schools in Thailand and schools across the US that use our new assessment programme, Measuring Academic Progress (‘MAP’). More on that later. Second, the even better news: while this is encouraging (and a testament to the hard work of our teachers), it’s not the main point. The main point is that MAP helps us measure individual student growth and pinpoint each child’s strengths and weaknesses. Seeing how we measure up to other schools is just a bonus! 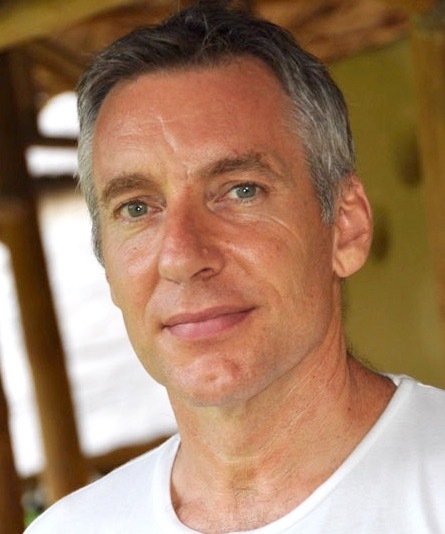 MAP is an online ‘adaptive’ test, as opposed to a standardized test (where everyone gets the same questions and they are either right or wrong). This means each student gets different questions according to their ability. So a Year 4 child could end up answering questions from Year 5 or even 6 or, if they are too difficult, from Year 3 or Year 2. MAP adapts to their ability. We assess the students at the start, middle and end of the year. That means that, from whatever point the student starts, teachers are able to see their growth. A Year 3 student who starts the year way below the Year 3 expectations, say at late Year 1 level, but who ends the year at middle Year 3 level, has made tremendous progress. Standardized testers might describe him as a failure. We see his progress as a huge success. By the same token, a Year 3 student who starts the year at an advanced level and finishes the year at late Year 3 level may be seen to have met the Year 3 expectations, but clearly hasn’t progressed as much as expected. We don’t get better at football by comparing ourselves with Ronaldo, but by seeing how much we have progressed after hard practice. This is what MAP helps us to see. After every assessment it produces a detailed list of strengths and weaknesses for every student, enabling teachers to differentiate instruction in the classroom and set individual learning goals for all of their pupils. It tells teachers what their students know (what their starting point is) and what they need to know (what their goals are). So, when we speak to students we don’t tell them, you are 6th or 16th in your class; we tell them: you started here and you have moved to there. This is about individual growth. While MAP is not a comparison tool, it is, however, understandable that parents want to know how Panyaden measures up to international standards. We know that many families choose Panyaden because we focus on social and emotional development as much as academics, but there is a perception that focusing so much on values, emotional quotient (EQ) and environmental education may be at a detriment to academic progress. We are delighted to confirm that the results show what research has been saying all along – that giving equal focus to these things actually enhances academic progress. It must be noted that these are averages and include advanced students and struggling students. It should also be observed that students start to make significant progress after Year 3. We believe this is due to the fact that in Years 1-3 we have many children who are still developing English skills (and MAP assessments are in English). That being said, we are very pleased with the results. MAP is used by thousands of schools in the U.S. and over 550 international schools in 160 countries. This year we will be adding Science, so we will now be able to assess Maths, English and Science. No preparation is needed by students. This should be a fun, learning experience, not a stressful test! This entry was posted in Featured Posts, School Curriculum and tagged assessment programme, map, Panyaden, tracking student progress.